We all go through primary training, and the curriculum is the same. The test is the same, the check ride the same. But what is vastly different is the instructor. When I got my ASEL ticket back in 1996, my instructor was great. He never yelled, he never badgered me, and he constantly passed along tiny morsels of aviator knowledge that he said I would use one day. He said that when I remembered something and got myself out of a jam, I could thank him later. After canceling a big trip to Cali this past week due to stubborn low freezing levels over the Siskiyou Pass adjacent to Mt. Shasta, I was itching to fly. So on Sunday evening, I went out to KEUG to practice a little crosswind landing technique. Wind was 240/11 steady so a landing on 16R or L would give me a crab to deal with the wind. But as I taxied out to 16L, I was rolling north and noticed a distinct veer to the right. Steve, my primary CFI, had taught me that at some point in your taxi out, let go of the yoke and pedals and see where the plane goes. Hint, if you are going to eventually land this thing, you want it rolling straight forward so as not to experience a seriously squirrelly roll-out. I do this instinctively before each flight, and I don't even know it, because it is now part of my aviator skill set. At the holding bay, I asked for and received permission from ATC to taxi back the other way on Bravo. This would be due south, so that strong left quartering crosswind would now be from my right. In theory, the plane should now be blown to the left, but as I rolled along hands-off, Katy still veered right, into the wind. As I sped up, the veer increased in intensity, so I aimed for the hangar and called it a day. As I rolled across the completely empty north ramp at KEUG, I turned all sorts of directions, and no matter where the wind was hitting the plane, her nose wanted to veer right. Something was amiss. In the hangar, I reached down and touched a seriously hot right brake disc. Sure, brakes are supposed to be warm, but I had hardly used the brakes. I compared it to the temperature of the left brake, and the right was hotter, confirming my suspicions of a dragging right brake. My mechanic has yet to find time to investigate and repair, and I do not suspect a serious issue. But the episode made me realize that had I not done my CFI's trick of going hands-off to look for any crazy veering issues when taxiing, I could have taken of and then got a really nasty surprise when my gear came back to Earth at 80 mph. A romp through the weeds might have been the outcome. 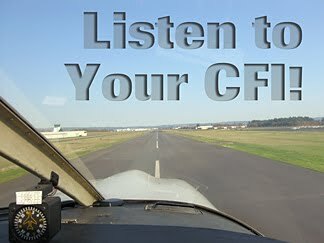 So, when your CFI tells you about these little nit-picky things they swear you as a rookie flyer needs to burn into your skull, believe them. It just might save your life and your airplane someday. Oh, and thank you Steve, where ever you are.